What is open source art and why is it important? How do the economics of open source art work? Who is doing interesting work in open source today, and what are they making? In this conversation, our panelists are creators of open source movements and users of open source software. They discuss different types of open source art, from programming languages and electronics platforms to software art whose code itself is open sourced, and follow the impact of several different systems since their inception. With moderator Zach Lieberman and panelists Scott Draves, Stefanie Wuschitz, Anton Marini, Lauren McCarthy and Evelyn Eastmond, we’ll discuss how open source is impacting the art space. Moderator Zach Lieberman has been developing open source art and code for his entire career. Zach is an artist, researcher, and hacker dedicated to exploring new modes of expression and play. He loves to make things and recently opened a new school, the School for Poetic Computation. He develops and is one of the co-founders of openframeworks, a c++ library for creative coding and works on the eyewriter project, a lowcost / opensource hardware and software toolkit that helps people draw with their eyes. The EyeWriter project won the Design of the Year (interactive) from London Design Museum, FutureEverything prize from the future everything festival and the Golden Nica in Interactive Art at Ars electronica. The eyewriter was also listed by Time magazine as one the 50 best inventions in 2010. Also, the IQ Font project won the Cannes Design Lion. Zach is one of the recipients of the AOL 25 for 25 grant, and was listed in Fast Company Magazine’s 100 Creative people in business. He cofounded the company yesyesno, and worked with Mago Julian making opensourcery, a performance that mixed software and close magic. Zach has helped with the IQ font, a project where a stunt driver drives a typeface; rhonda, a 3d drawing tool that helps people sketch ideas simply in 3d; sonic wire sculptor, its musical cousin, and jigazo, a reconfigurable jigsaw puzzle. Panelist Stefanie Wuschitz is a lecturer, researcher and media artist from Vienna. She graduated with honors from the University of Applied Arts, Vienna, and completed her Masters at NYU’s Interactive Telecommunications Program. 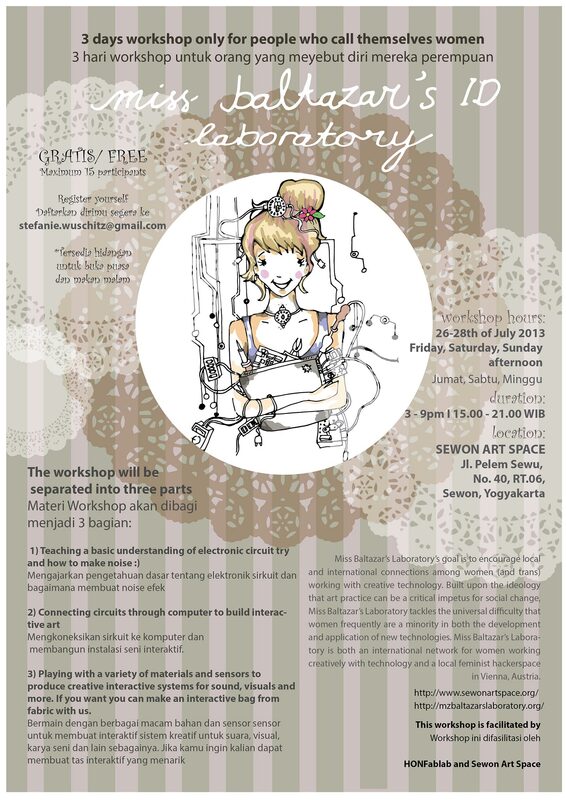 During a Digital Art Fellowship in Sweden she coordinated the Eclectic Tech Carnival 2009 and founded Miss Baltazar’s Laboratory. At the moment she is a doctorate candidate at the University of Technology, Vienna, researching on women and trans artists in Syria, working with interactive technology and teaching part time at the University of Applied Arts Vienna at the department of DIGITAL ART. Her art work has been presented among others at the following venues: the Austrian Cultural Forum (NYC), Galeria Hippolyte (Helsinki), Okno (Bruessels), Videonale (Bonn), Goethe Institut (Damascus), Arthall (Budapest), Worm (Rotterdam), Murberget (Härnösand), the Ars Electronica Festival (Linz), Transmediale (Berlin), ViennaFair (Vienna), DogPigArt (Taiwan). Scott Draves is a pioneering software artist best known for creating the Electric Sheep, a collective intelligence consisting of 450,000 computers and people that uses mathematics and genetic algorithms to create an infinite abstract animation. His work has been shown at LACMA, MoMA.org, Prix Ars Electronica, ZKM, Art Futura, Emoção Art.ficial Bienial and is in collections world-wide including Carnegie Mellon School of Computer Science, the 21c Museum Hotel, MQS Capital, Google, the Simons Center for Geometry and Physics, and MEIAC. His clients range from Skrillex to the Adler Planetarium. Electric Sheep apps are available for iPad and Android. Watch his autobiographical documentary video. Anton Marini designs and performs with his own realtime video software. His work focuses on improvisation, realtime manipulation of video and moving images, of synchronization of synesthetic devices. He plays, bends, rips, tears, shreds, morphs, molds, blends and synthesizes pixels to form new visual experiences. His work is an ongoing effort to find a means of dynamic expression through moving image. He keeps a journal of his progress and distractions here: abstrakt.vade.info. Feel free to follow along. Evelyn Eastmond and Lauren McCarthy are working on a version of Processing for the web.